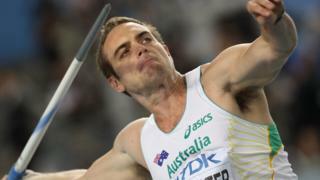 Former Commonwealth Games gold medallist Jarrod Bannister has died aged 33, Athletics Australia has confirmed. The javelin thrower, a two-time Olympian, had been living and training in the Netherlands. Australian media outlets reported there were believed to be no suspicious circumstances in his death. Athletics Australia said it was "saddened and shocked", while a number of athletes posted tributes online. "On behalf of Athletics Australia, I extend our deepest condolences to Jarrod's family and friends and urge the athletics fraternity to support each other at this difficult time," chief executive Darren Gocher said in a statement. Bannister is Australia's javelin record holder with a throw of 89.02m in 2008. He won gold at the Commonwealth Games in Delhi two years later. He also represented Australia in the 2008 and 2012 Olympics, as well as several world championships. In 2013, he was controversially given a 20-month ban from competing after missing three anti-doping tests. Bannister maintained that he had not missed them deliberately. He said in one instance testers had been given wrong information about his whereabouts.